Discussion in 'Political Debate & Discussion' started by InTheLight, Aug 2, 2016. Trump's jobs stimulus plan would spend much more than twice the amount that Hillary has proposed and approach or exceed Obama's stimulus plan of 2009, "The American Recovery and Reinvestment Act of 2009". which ended up spending about $830 billion. On Fox News Business channel, the Stuart Varney show, Trump outlined his plan. Hillary Clinton's plan would spend $275 billion on infrastructure improvements which Trump called inadequate, stating he would spend twice as much and possibly more. 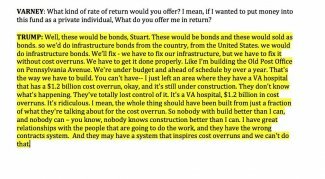 He would finance the plan by selling government bonds (read: More Debt). So more big government programs. More spending. More debt. More deficits. Sure, sure. Desperation is you trying to rationalize a $1 trillion public jobs program after you denounced Obama's similar plan. Essentially Trump will be printing money to finance his plan. But, no rebuke on your part. I understand. Hillary must be stopped at all costs, which includes going another $1 trillion in debt. OK? what is the problem with that. You seem to make more out of Trump than Hillary which is a huge problem. OK? what is the problem with that. The problem is the lengths that people will go to in order to stop Hillary. They're silently accepting a $1 trillion socialist works program, accepting the deportation of people based on religious and/or nationality reasons, accepting a candidate that insults and demeans people on a daily basis. A serial adulterer, liar, casino owner, and fake Christian. You seem to make more out of Trump than Hillary which is a huge problem. I think most everyone on BB is against Hillary. Her positions and flaws are well known. Furthermore, posting stuff about Hillary will result in almost no discussion. The problem as I see it, is that conservatives, and especially conservative Christians, are compromising their beliefs and long standing political stances by supporting Trump. 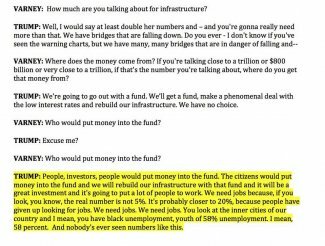 If anyone other than Trump would have proposed a $1 trillion public works jobs program it would have been roundly denounced as the pork barrel project and socialistic program that it is. But...but...but...Hillary might get elected so now these same people just look at their shoes and don't say anything. Congress makes the spending bills. The President appoints Supreme Court justices. Yes. Supposing Trump gets elected President and the House stays in Republican control. Would you be in favor of Trump's jobs program? Might. Might not. Depends on what it is when it actually comes up. I'll worry about it after the serial liar criminal traitor, Hillary, is consigned to political oblivion. What's there to know? It's a big government public works program. What business does the federal governement have in repairing anything except interstate highways? Why should the federal government be involved in repairing what Trump called our "Third World airports"?
. . . they have the wrong contracts system.